Not surprisingly, most of the debates over the defense budget on the Hill have been extremely partisan. There is one exception, and that is the bill concerning Pentagon cooperation with “Rosoboronexport,” Russia’s state-controlled arms corporation. On killing this deal, the House was almost unanimous. The House version of the defense spending bill would prohibit the U.S. government from cutting arms deals with the Russians regardless of how detrimental to American national security interests it might turn out to be. U.S.-Russian cooperation on arms sales started just last year. According to the three contracts existing between the U.S. Defense Department and Russian arms export company, the United States has so far purchased 33 brand new Mi-17 helicopters for the Afghan National Army for $640 million. The multipurpose aircrafts are durable and cost effective in harsh Afghan weather conditions, and based on Pentagon Undersecretary for Policy James Miller statement “The Mi-17 acquisition effort is critical to building the capacity of Afghanistan security forces." However it appears that U.S. lawmakers didn’t appreciate American-Russian cooperation on Mi-17 choppers from the beginning. In March, U.S. Sen. John Cornyn (R-Tex.) led the opposition to the helicopter contract, sending a letter he signed along with 15 colleagues to Defense Secretary Leon Panetta on March 12. The missive criticized the deal on the ground of Moscow arms cooperation with Syria. For Moscow, American distaste for Russian weapons is hardly a new story. From 2006 to 2010, transactions with “Rosoboronexport” were banned because of its weapon sales to Iran and Syria. The politically and most likely economically motivated sanctions were lifted in 2010, following Russia's support of a U.N. resolution over Iran's nuclear program, according to the Congressional Research Service. But the latest House amendment to next year’s defense budget, which is intended to chop the Pentagon deal with Russia, seems to be déjà vu all over again. Indeed Russian arms contracts with Damascus are worth about $5 billion and last year alone, “Rosoboronexport” had sold Syria 36 training jets and air defense systems for about $1 billion. However Rep. James P. Moran (D-Va.) who introduced the amendment to the budget bill on July 19 may not have known that Moscow made a decision on July 9 to suspend all delivery of weapons, including helicopter gunships and advanced S-300 ground-to-air missiles, to the government of Bashar al-Assad. “Russia along with other countries has concerns about the situation in Syria. Until situation in this country stabilizes we will not be making arms deliveries,” Vyacheslav Dzirkaln, who is deputy director of Russian Federal Service for Military-Technical Cooperation told news agencies. Speaking on July 25th at the Brookings Institution, Michele Flournoy of the Center for a New American Security and former under secretary of defense policy confirmed that the White House believes that it did manage to convince Russia to stop arms deals with Syria. “We have had some significant success in preventing Russia from resupplying and rearming the Syrian military. We have been able to stop the last shipments. For example Russia repaired a bunch of helicopters for Syrians, but we were able to turn them around,” Flournoy said. U.S. Rep Rosa DeLauro (D-Conn.), was very proactive in supporting Moran’s amendment and even passionately took to the House floor to speak in support of it. DeLauro represents Connecticut, the home state for Sikorsky Aircraft Corp., the largest U.S. helicopter company. “American lawmakers nowadays rarely come together on certain issues because of very partisan debates on key domestic policy topics. But bashing Russia is something that everybody on the Hill can afford,” said one Congressional staffer familiar with helicopter debate. Avoiding the use of Russian-made choppers for Afghans "would require a kind of wholesale restructuring of their air force to shift to western equipment," Stephen Flanagan, a national security analyst at the Center for Strategic and International Studies in Washington told Bloomberg. Analysts also said that procuring American-made helicopters, for instance UH-60 Black Hawks—which are not made for the extreme environments of Afghanistan--would be much more costly for the Department of Defense with its budget being slashed. In a talk with RBTH well before the House’s recent vote, former U.S. Ambassador to NATO Kurt Volker, senior fellow at the Center for Transatlantic Relations, said that U.S.-Russian cooperation in arms sales “seems logical,” because Russian equipment is quite durable and familiar to Afghans. It is also less technologically sophisticated then American-made weaponry, thus reducing risks for the United States if it eventually gets in the wrong hands. Even if the Pentagon stops doing business with the Russian arms company, it would hardly be a blow for Rosoboronexport. Russia is second only to the United States in arm sales around the world. 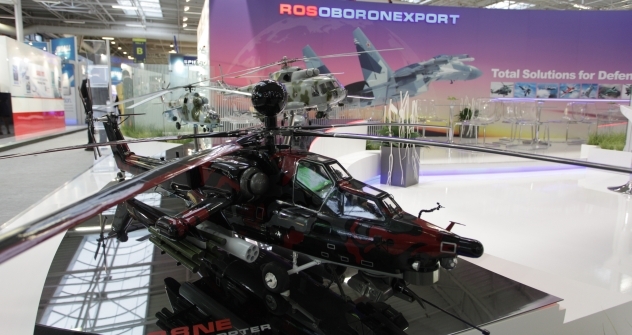 Anatoly Isaykin, Rosoboronexport ceo, said that the company has open orders for $33-35 billion.